Irish Mist, the most famous Irish whiskey liqueurs. Produced from herbs, honey and Irish whiskey, Irish Mist takes its roots in the ancient recipe of heather wine, which origin goes back over a 1000 years. This legendary drink, passed on generations through centuries, was the favourite of old Irish clans' chiefs. Forsaken during the great exodus of the Irish in 1691, it is only halfway through the 1940's a European traveler found back the lost recipe of heather wine, in an old manuscript. Desmond E.Williams, owner of the Tullamore distillery, crafted his Irish Mist from 1947 by taking inspiration from this discovery. First liqueur to be produced in Ireland, Irish Mist really stands out. Its unique sweetness and warmth combines the distinctive character of an Irish whiskey with gourmet honey and spicy notes for an amazing result of finesse and complexity. Irish Mist is the brand of the first liqueur to have been produced in Ireland when commercial production began in 1947 at the Tullamore distillery. Tullamore is the hometown of the Williams family who were the original owners of Irish Mist. The company's history dates back to 1829 when Tullamore Distillery was founded to produce irish whiskey. Due to a base of triple-distilled Irish whiskey aged in oak casks, Irish Mist develops a refined and sophisticated taste. Nose: a blend of honey and Irish whiskey, with complex spicy notes. Fruity hints (orange peel and apricot) with vanilla undertones. Palate: a heavy and sweet texture with a pronounced taste of honey and whiskey, evolving onto spices and bitter dark chocolate. Perfect balance. Finish: a perfect balance between mellow Irish whiskey, sweet and complex spices. This balance leaves an impressive flavour that lingers on the palate. 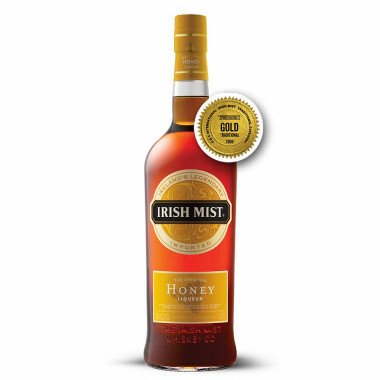 Irish Mist picked the 2008 Gold Medal at the World Spirits Championship San Francisco, and the 2008 Gold Medal at the Spirit Business Magazine’s Liqueur Masters London. This liqueur may be served with cola and lemon : use 1/3 of Irish Mist with 2/3 cola and a quarter of squeezed lime (the tangy taste of lemon balances the flavours).